2014 Innovation & Entrepreneurship Day at the Capitol – A Major Success! Innovators and entrepreneurs from around the state filled the rotunda and hallways of the State Capitol on January 29 for “2014 Innovation & Entrepreneurship Day.” Co-sponsored by TechConnect West Virginia and Industries of the Future-WV, the event drew nearly 150 people to Charleston to show support for West Virginia’s innovation economy. Forty-six exhibitors from a wide variety of industry sectors and organizations demonstrated that innovation is alive and well across the state. Nearly 130 entities joined the effort (click here to see list) as participating organizations, up from 85 last year. “For the second year in a row, we achieved our objective to showcase innovation companies, entrepreneurs, manufacturers, lending organizations, technical assistance groups, agencies, and firms that make up the state’s innovation economy,” said Anne Barth, Executive Director of TechConnectWV. “The wide variety of exhibitors helps to demonstrate the steps in the innovation lifecycle—from research and development, to commercialization and startup, to a new business gaining a sound financial footing—and what is needed to help the entrepreneur at each step,” she added. Exhibitors included eTouchSciences, led by CEO and WVU Mathematics Professor Dr. Marjorie Darrah, which was the 2013 winner of TechConnect’s Spirit of Innovation award in the startup category. “The event also was another good indicator of how this sector of the state’s economy is becoming more widespread and self-sustaining. Our entrepreneurs range from students to people who are launching a second career, and all of them are making a positive impact on the economy in their communities and across the state. “We even heard from one exhibitor who reported that they may have generated significant new sales by participating in the event,” Barth said. And, the West Virginia Senate recognized the day with a special resolution sponsored by Senate President Jeff Kessler and Senators John Unger, Clark Barnes, Craig Blair, Sam Cann, Mitch Carmichael, Bill Cole, Mike Hall, Art Kirkendoll, William Laird, Brooks McCabe, Ronald Miller, Corey Palumbo, Ron Stollings, Dave Sypolt, Chris Walters, Erik Wells, Bob Williams, Jack Yost, Herb Snyder, Gregory Tucker, Robert Plymale, Roman Prezioso, Donald Cookman, Rocky Fitzsimmons, Evan Jenkins and Daniel Hall. In the House of Delegates, Speaker Tim Miley joined Delegates Doug Skaff, Jason Barrett, Bill Hartman, Carol Miller, and Joe Ellington in recognizing the day with a special Citation. “TechConnect is very grateful to the Governor and Members of the Legislature for shining a light on innovation and entrepreneurship as drivers of economic growth,” Barth said. Industries of the Future-WV presented the Governor’s Award for Leadership in Advanced Green Manufacturing to Berkeley Springs Instruments and the Governor’s Award for Excellence in Industrial Energy Efficiency to Koppers, Inc. This event was just one of several that week in Charleston, creating “Innovation Week.” On January 28, the 4th Annual WV Biosciences Summit was held, featuring West Virginia native Dr. Mark Bates as the keynote speaker. Read more about his fascinating journey in medicine and innovation in the Daily Mail and the Gazette. Thursday, January 30, was Undergraduate Research Day at the Legislature, with exhibits from colleges and universities around the state. Economic developers from around the state gathered January 29 for the WV Economic Development Conference. 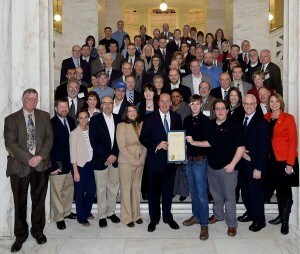 To see photos from Innovation and Entrepreneurship Day at the State Capitol and the 4th Annual WV Bioscience Summit, visit TechConnectWV’s page on Facebook.